The nine-banded armadillo is very distinct and is not easily confused with any other animal that is found in Illinois. 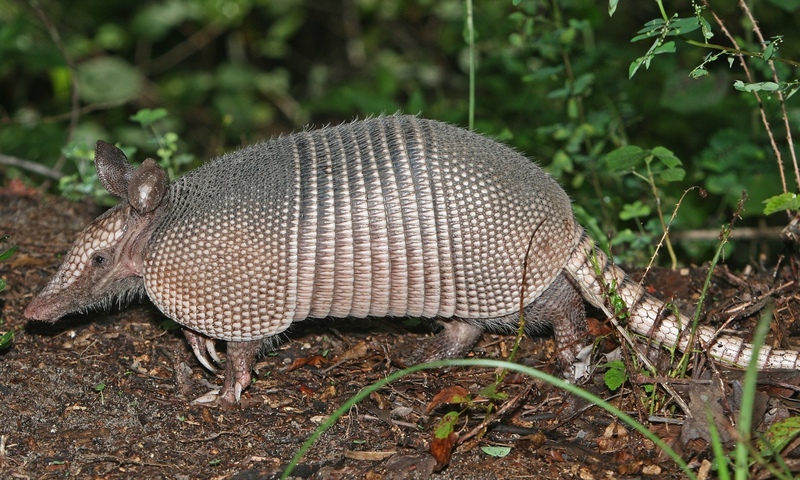 Armadillos are the size of a large cat, and though their body shape resembles that of an opossum. They are most closely related to sloths and anteaters. Armadillos have a carapace of bony plates covered with leathery skin that may be mottled brown to yellowish-white in color. They have very little hair. The head is long and slender, with ears that are approximately 40 percent the length of the head. Armadillos have relatively short legs. There are four toes on the front feet and five toes on the hind feet, all with well-developed claws for digging. The tail is almost as long as the body. 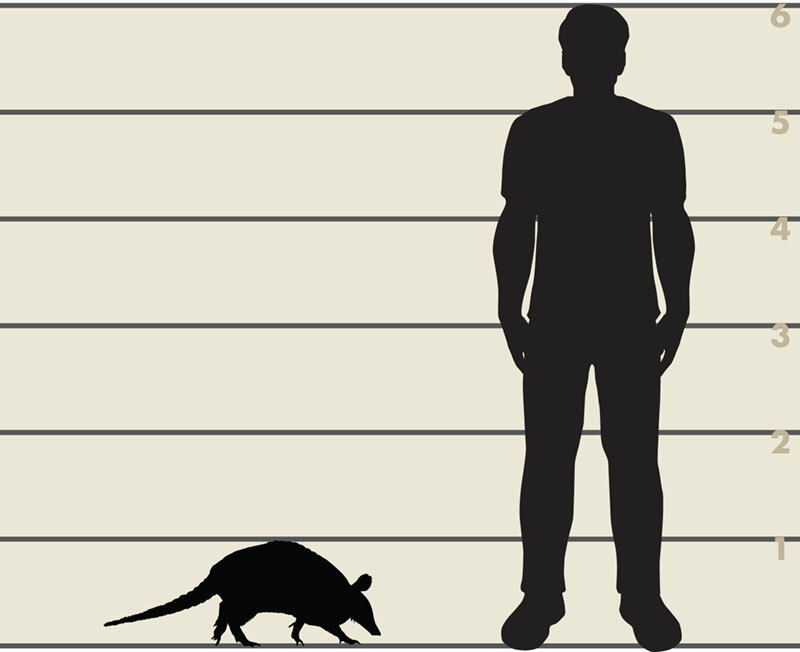 Size comparison between a six-foot tall man and an armadillo. Armadillos can only survive in areas with a constant source of water that have annual temperatures above 28 degrees Fahrenheit. Since they depend heavily on insects as a food source, have very little hair and do not hibernate, armadillos cannot survive when the ground is frozen for more than a few days. Armadillos have been sighted in northern counties in Illinois, but the majority of sightings have occurred in the southern half of the state. 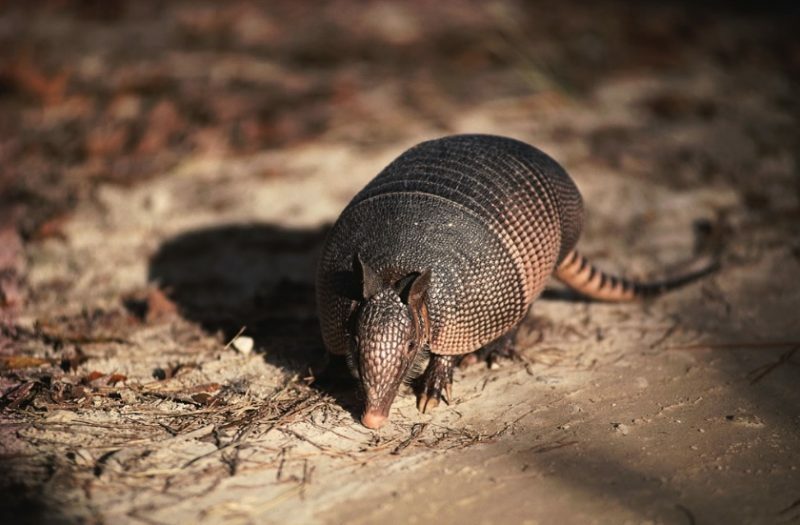 There have been more than 160 sightings of armadillos in Illinois since the 1990s. Of these, only a couple dozen sightings have been confirmed through photos or specimens. If you have recently seen an armadillo in Illinois, please REPORT the sighting to the Illinois Department of Natural Resources.